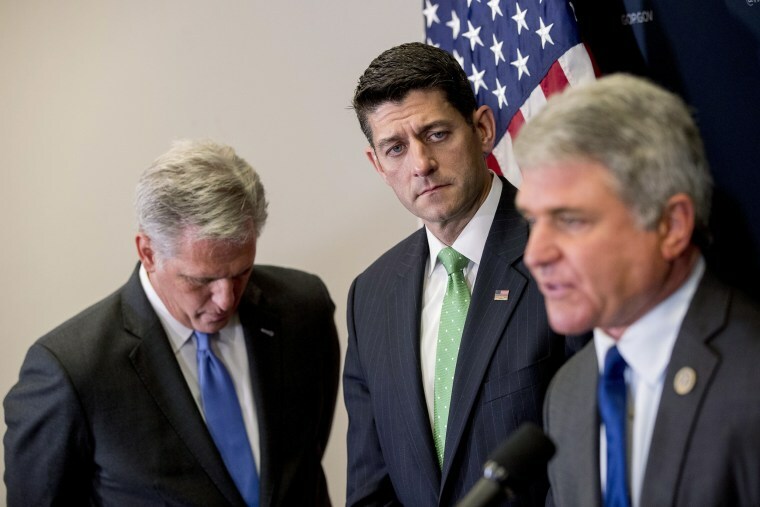 WASHINGTON — Republican leaders in Congress are moving forward with their vision of tax reform, planning to release a framework of a proposal in the next two weeks. At the same time, President Donald Trump has been holding meetings with Democrats about how to tackle the issue, opening up the door for a more bipartisan approach to the legislation. How all the planning and discussions play out in a divided Congress is a big unknown but Republicans leading the tax talks are beginning to brief their rank-and-file members on where negotiations stand on reforming the country’s tax system, and they feel like they are making progress. Tax negotiations have been going on for months between Ryan, Senate Majority Leader Mitch McConnell, Senate Finance Committee Chair Orrin Hatch, House Ways and Means Committee Chair Kevin Brady, Treasury Secretary Steve Mnuchin and White House Economic Council Director Gary Cohn. Those talks have progressed more slowly than first anticipated. And while there is a lot of heavy lifting ahead, there are also signs of progress. The six negotiators, aiming to lower the tax burden on both businesses and individuals, have moved closer to an agreement on several areas for both, according to a lobbyist familiar with negotiations. Talks are still ongoing and things could easily change but there are some broad outlines beginning to emerge. The proposal is expected to include a reduction of the mortgage interest deduction by either capping it or eliminating it altogether and increasing the standard deduction in its place. But Rep. Brady said that eliminating the deduction is not likely. “The mortgage interest deduction, the incentive for home ownership, will remain on the postcard,” Brady said. The state and local tax deduction could also be eliminated. It’s another popular itemized deduction that benefits people who live in big states with higher local taxes — which also happen to be Democratic states like California, New York, New Jersey and Illinois. Another revenue raising tax that is on the table to be reduced or eliminated is the tax on interest gained from investments that produce income. The corporate tax rate could be reduced from the current level of 35 percent to between 20 and 25 percent, but it won’t likely go as low as the 15 percent that the president has called for. It is also possible bill writers will increase the exemption amount of the estate tax, which currently sits at $5 million. While Republicans and administration officials are moving forward with their version of tax reform, Trump continues to reach out to Democrats. “More and more, we're trying to work things out together. That's a positive thing, and it's good for the Republicans and good for the Democrats,” Trump said after a Wednesday afternoon meeting to discuss tax reform with eight moderate Democrats and five centrist Republican House members. And on Wednesday night, the president hosted Senate Minority Leader Chuck Schumer and House Minority Leader Nancy Pelosi for a White House dinner to talk about a range of issues. The night before, he dined with a bipartisan group of senators, including three Democrats — Sens. Joe Manchin, D-W.Va., Heidi Heitkamp, D-N.D., and Joe Donnelly, D-Ind. — from states that Trump won and all up for re-election in 2018. “The president was adamant from the get-go this is not a tax cut for the rich. And I repeat that, this will not be a tax cut for me or any rich people. That kind of started off the conversation. It went pretty good from there,” Manchin said on MSNBC’s “Morning Joe” of the meeting. Trump reiterated later that reform would not be a tax cut for the rich. His legislative affairs director, Marc Short, clarified that the president is not looking to “raise rates” on the wealthy but that he was making the point that the wealthiest are most often are able to take advantage of deductions. Short said a simplified tax code would presumably eliminate the opportunity and that it’s “conceivable” wealthy people will pay more. Republican leaders on Capitol Hill insist that Trump's bipartisan outreach is not undercutting their attempts at writing legislation that can get the support of 50 Republicans. “So that means you could end up doing tax policy with ‘Chuck and Nancy,’” Brat said, referring to Trump’s friendly moniker for Senate Minority Leader Chuck Schumer and House Minority Leader Nancy Pelosi. Hallie Jackson, Monica Alba and Alex Moe contributed.